After all that cookie butter ice cream you've no doubt been cramming down since Nathan's last post, you surely think you oughtta go get a salad, right? 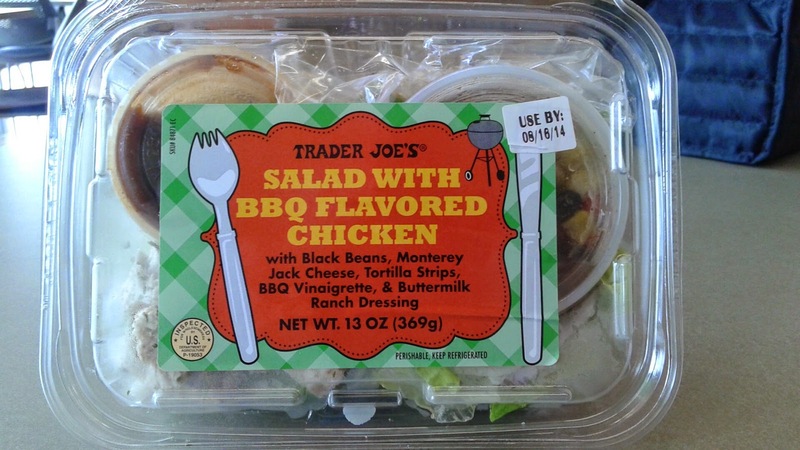 I wish I could say the stomach volume displacement value of Trader Joe's Salad with BBQ Flavored Chicken was at least some variant of equality, but it's not. There's a lot of promise - beans, cheese, tortillas, spicy chicken, all of which are right up my alley - but in actuality, the spork on the front sticker should've been a key tipoff: this is one salad that can't decide what it is or what it wants to be. Kinda like freshman year, I suppose. It's an okay lunch pick-up, but there's too much that's off to make it worth a regular rotation spot. Let's count the ways. First, the chicken. The word "flavored" in the title should have been another hint that I whiffed on. The chicken is not barbecued, nor is it, technically, BBQ flavored. Instead, the BBQ flavor comes from a mini bucket of some invented product called "BBQ Vinaigrette." Let's be serious here - have any of you ever encountered the existence of such a product before? There's no such item listed for sale on Amazon, which means, to me, it's not real. It's kinda tangy and BBQy but definitely tastes like watered down sauce, but watered down with vinegar. Okay, but not that great. The ranch dressing is only semi-awful and doesn't add a lot. And the beans? Well, they're mixed in with some corn and diced red pepper, which is okay, but instead of being at least somewhat fresh, it's more of the canned variety, with some sort of goop coating them that makes them taste a little pickled, almost. With the two different dressings and the beans etc, that makes for not one, not two, but three (!) little cups inside that take up a lot of space in both the salad container and your friendly local landfill. Seriously, there's got to be a better way. On the plus side: Lettuce is fresh and crispy, has that "just chopped" feel to it. The MJ cheese seemed particularly good (though perhaps an overstatement - first cheese I've had in a while) and the tortilla chip strips add a good little crunch. If you happen to like the dressings, a little goes a long way - I barely blipped mine in, gave it a good mix, and still had a couple small pools at the bottom. That helps cut down the more unsavory nutritionals too, of course. Getting back to that point of "not knowing what it is": it's just a weird mix. If it wants to be a BBQ chicken salad, then put in actual BBQ chicken, some greens, some cheese, maybe a pepper or two, and skip the black beans and corn and whatnot. If you want to keep the beans and corn, nix the BBQ and go for a chipotle ranch dressing. 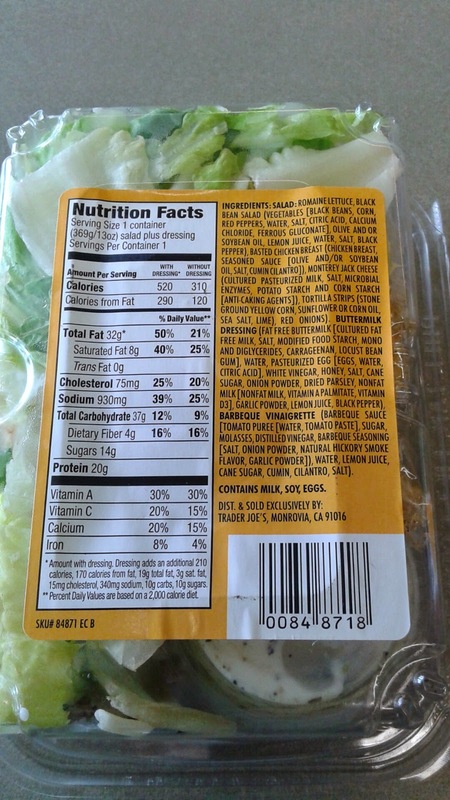 Or maybe even better, just skip both dressings, or maybe just skip this salad altogether. Perhaps I'm being harsh after a long, frustrating day, but I'd prefer more tastiness for something that looked like it held enough promise for me to drop a hard-earned $4.49 on it - I could have gotten a buffalo chicken salad from the work cafe for the same price and been much happier. I'll try to be kind, but in the end, best case scenario to me, it has "meh" stamped all over it. I love when they list "olive and or soybean oil." It's like saying "olive oil, and or urine."